Abstract: The relation between the coherence length (or coherence time) and the optical bandwidth of light is usually supposed to be very simple, but interesting issues are encountered in the context of trains of ultrashort pulses from mode-locked lasers. In particular, mode-locked lasers can exhibit very high temporal coherence despite emitting very broad optical spectra. The results are relevant for technical issues of high current interest, in particular in the field of frequency metrology. A recent paper explains a number of issues in surprisingly simple terms. Ultrashort pulses of light naturally have a broad bandwidth, i.e. a wide Fourier spectrum. This seems to suggest that their coherence length is very small. Do we have to conclude that mode-locked lasers generating ultrashort pulses are light sources with low temporal coherence? The question actually touches interesting aspects. Let us first consider a single ultrashort pulse. Its coherence function is quickly decaying – not because its optical phase is fluctuating, but simply because its intensity decays so quickly. So in that case the low coherence time (and subsequently the short coherence length) has nothing to do with noise. 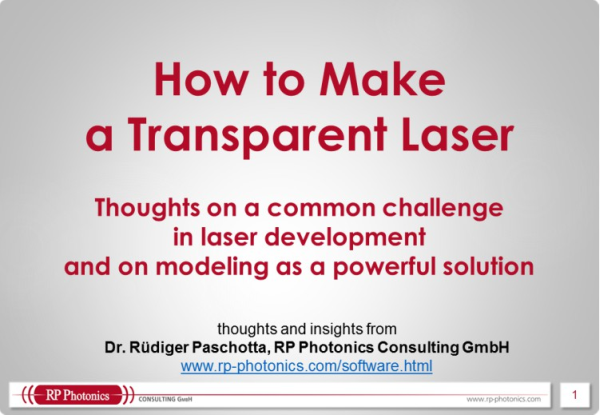 Now consider a mode-locked laser, emitting a periodic train of ultrashort pulses. As all these pulses are related to a single pulse circulating in the laser cavity (assuming that we are not dealing with harmonic mode locking), and this pulse usually experiences only weak noise influences in each cavity round trip, there is a strong phase relation between subsequent pulses, and even between pulses with a large temporal distance. What is then the shape of the coherence function? First it quickly decays on the time scale of a pulse duration, but then it has “revivals” at time values corresponding to integer multiples of the pulse spacing, describing the possibility of interference by superposition of such pulses. For increasing time delays, these peaks are slowly getting weaker and weaker due to noise influences, but there can be many thousands of strong peaks in the coherence function. Quite obviously, the coherence is not fully described by a coherence time which is related to the width of the first peak (around zero time) of the coherence function. In a way, we have very long-term coherence, but can only observe it for time delays which allow the overlap of pulses. Even in that special case there is a strong relation between spectral width and coherence time. We have to take into account, however, that the Fourier spectrum of such a pulse train is not continuous, but rather has the shape of a frequency comb. The “real” coherence time (describing the long-term phase relationship between distant pulses) is of the order of the inverse width not of the envelope of the Fourier spectrum, but of the single peaks of the frequency comb – and these can be very narrow indeed. For that reason, frequency combs are very interesting for application in frequency metrology. A question of strong current interest (particularly for metrology) is how strong the temporal coherence in trains of ultrashort pulses can be for different kinds of laser sources. Although this involves a number of really sophisticated technical details (partially of mathematical type), the paper quoted above explains some central issues in a surprisingly simple way and gives relatively simple guidelines concerning which lasers have the potential for low noise in frequency combs, and how different types of noise are related to each other. For example, timing jitter always leads to a somewhat increased linewidth for the lines in the wings of the comb spectrum, and quite simple equations allow to calculate the quantum-limited noise level for all the comb lines.